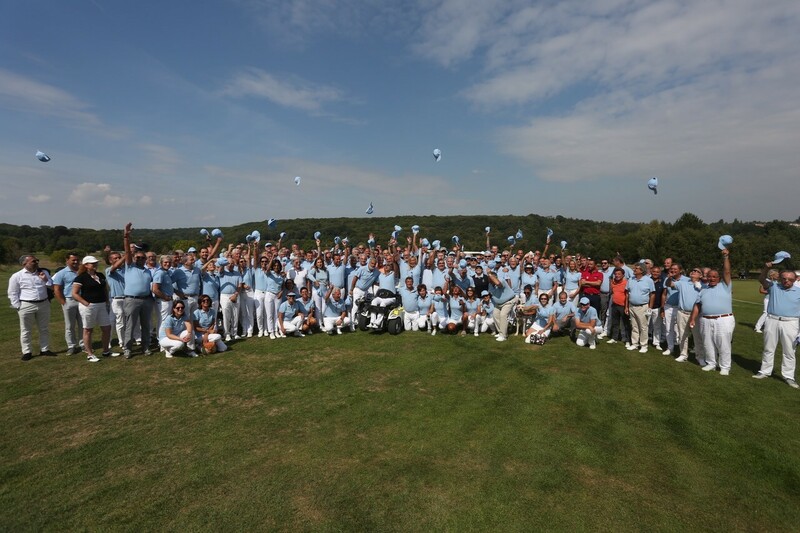 On September 3rd, the Kadima Cup Beit Halochem Masters was held for the first time, a friendly golf competition in the prestigious setting of the “Joyenval” golf course for the benefit of the IDF Disabled Veterans Organization – Beit Halochem. March 2016, Marc Harari discovers the Tsahal Disabled Veterans Organization, Beit Halochem Invalid Organization thanks to a friend. Moved and excited by the visit he was resolved to dedicate time and energy for the benefit of the Organization and its members. September 3, 2018, after several months of hard work, surrounded by an outstanding team (Bernard Kahn, Gérard and Stéphanie Katz, Thierry Sulman) and generous sponsors (Transopera Transaction, Village Blue Real Estate, Herez, Marc Harari Consulting, El Al Israel Airlines and Golf Repair Shop), Marc Harari welcomes more than 180 golfers to compete against our 3 Beit Halochem champions: Zohar Sharon, Shlomo Ivgi and Eli Shrira. Zohar Sharon was a sniper in the Paratroopers brigade when he lost his sight during a combat mission at the age of 23. Despite his disability, he developed a talent for golf and began his apprenticeship more than 15 years ago. Six-time world champion for blind golfing, he can now complete an 18-hole course with a handicap B31 and can beat seeing golfers, too. Former soldier with the Golani infantry brigade, Shlomo Ivgi was wounded while in training. A bullet penetrated his spinal cord leaving him a wheelchair bound paraplegic at the age of 18 yrs. 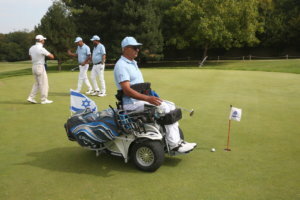 Seven years ago, with the purchase of the first ParaGolfer by the IDF Disabled Veterans Organization, Shlomo Ivgi began golfing. He has since won the German Open in 2014 and came in 2nd in the Israel Championship in 2015. Finally, Eli Shrira, severely wounded during a rescue mission in southern Lebanon in which he lost his leg and his eye, he began playing golf with his wife a few years ago. He has since achieved 3rd place at the Open Golf in the Czech Republic in 2018. 13:30hrs: The competition is launched in a friendly atmosphere. Players scatter through the green lawns of the “Joyenval” golf course for 6 hours of a friendly competition. 20:30 hrs: Awards ceremony and cocktail party. This is the opportunity for the Zahal Disabled Veterans Organization – Beit Halochem to thank the organizers for this wonderful initiative which led to over Euro 100,000 being raised and to offer the possibility to the generous participants to become aware of the importance of the Zahal Disabled Veterans Organization – Beit Halochem, the rehabilitation of its members, as well as the immense courage will power of these 3 outstanding personalities. September 3rd was a day rich in emotion and exchange, the beginning of a strong and lasting friendship.